Format of request letter to send to school and asking them to grant you school leaving certificate as you have to leave the school due to financial crisis, moving away or any other reason. Hope you find this in good health. I have been a student in this school right from the nursery and I have maintained good grades since the primary classes. I never imagined that there would be a day where I have to leave this school other than when I graduate. But due to unfavorable circumstances that arise in my home after the death of my father, there is no way I can afford the tuition fees of this school. With a heavy heart I would request you to grant me a school leaving certificate so that I can continue my studies through private means. The purpose of writing this letter is to inform you that I am leaving the school this month. As you know my father is an army officer and he gets regulars transfers from the Army Head Quarters. This time they have transferred him to Ohio State, which is 800 miles away from this state. Our family has taken the decision to move on with my father. We are leaving this state by the end of this month. I need a school a leaving certificate to get admission in the next school. With due respect, I wrote this letter to request you for my school leaving certificate. As you know that A- level is pretty much expensive so it is not easy for everyone to afford. I was on scholarship in my first A-level year on the basis of my O level grades but unfortunately due to some personal issues, I could not focus on my academics in AS Level and my grades dropped drastically. According to the school’s policy if someone does not maintain their grades then their scholarship is automatically cancelled. At first my parents thought they would be able to manage the fee but due to financial problems it is not possible so I will have to drop out from the school and probably will have to appear privately for my CAIE Exams. I had a great time in this campus and really enjoyed my A level. I request you to kindly approve my application so that I can get my School Leaving Certificate as that would be needed when I will start the application for my admission at any university. I would be very grateful to you. With all due respect I am writing this letter to inform you about a very unfortunate situation. My father’s business has not been doing very well lately and with his deteriorating health it is now my responsibility to take care of the business. Our financial instability leaves me no choice but to drop out of school for the time being and focus on our family business rather than my academics. I request you to please provide me with a school leaving certificate with the valid reason of why I am leaving school. I hope you will acknowledge my situation and provide me with the certificate. 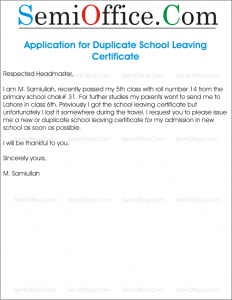 Sample Application for School Leaving Certificate with Complaint/Dissatisfaction. Application for School Leaving Certificate from Parents’ dissatisfaction to school principal to issue the certificate in earliest possible time. School Leaving Certificate is compulsory to get admission in the next school or to change the school of your children. My kids are studying in your school since three years but unfortunately I am not seeking progress as it should be according to my requirements and as well as fees I am depositing. I am not satisfied with your school environment where teachers are not focusing on development of students. Your teachers leave frequently so this is showing the lack of commitment of teachers with your school. Moreover your school is increasing fees month by month and this is not affordable with present school facilities, teaching standards and results. I request you to please issue school leaving certificates of my kids and please change your policy for teacher’s salaries/troubles/grouping, so they may not leave your school in short times. According to my observation your school is damaging the future of students. This is my observation and it can be wrong. But I write this all to acknowledge why I want my kids to leave your school. I hope you will consider my complaint as suggestion and improve your educational standards. Looking to receive leaving certificate on priority basis. Editable SCHOOL LEAVING CERTIFICATE is required. School leaving certificate format english. School leaving certificate sample pdf. School leaving certificate format in word. School leaving certificate format free download. It is certified by this office that Mr./ Ms. Shaheen, S/D/O Shabbir Khan, Domicile No. 31X02-VSGG563-1 has been enrolled in this school in Class 10th of 20XX, under registration no. XCSXE16. She has been found abiding by the all rules and regulations of the school and performed well in his academic and co-curricular activities at this school. This school accepts her reason for leaving the school and recommends her for admission in any academic institution in the same grade. Sample application letter to request college leaving certificate or letter for admission in next college or changing college from one city to another or in the same city. Find school leaving certificate here. Most respectfully, this is stated that I have been studying under your kind control since April. Currently, I’m continuing my ‘Bachelors in Science program which is going to end in June. Unfortunately, due to some domestic reasons we have shifted to Sialkot, hence this is no more possible for me to stay in Lahore. Please issue College Leaving Certificate for me as soon as possible so that I can enroll myself in the next institution without harming my studies. It is stated respectfully that I, Zargham, is a student of ES-3, under reg. no. 033. I am leaving this college because of shifting of family to the Ankara. Kindly Issue me the college leaving certificate so that I can present it to secure admission at new college there. I shall be thankful to you. It is stated that I am a student of A-levels in this college but would not be able to continue my studies here. The reason of leaving this college is the job of my father. My father has been transferred to another city because he got a promotion. My whole family is going to travel and will be settle down there with my father. This college means to me everything and it’s a very hard decision of leaving to make but I got no other option. My father has already found another college there and to apply there I need a leaving certificate from this college. I have attached my student ID card copy and other required document with this application. I will be missing this place and the quality of education from which I learned a lot. I will be very thankful to you. Sample application letter for leaving job certificate from the employer to present new employer or need to submit with new job application as experience letter. Clearance letter for leaving job. Sir, I am Fisher Keane and I am an employee at your renowned company. I have been working here for the last 6 years and I’m lucky to have had the pleasure of working alongside you. The colleagues here helped me a lot and they treated me like I’m family. However, due to some problems at home, with full regret I have to say that I have to quit this job. My father got very sick and he’s unable to handle the business on his own so I would like to help him continue running his business. It is hard for me to leave your company but I have to do this for the sake of my own family. Kindly issue me a job leaving certificate. I hope you understand my situation and I would be very glad to keep in touch. With due respected it is hereby stated that I had submitted my resignation letter from the position of Regional Facilities Manager on 05.11 and I’m serving the mandatory notice period which is to end on 5.12. I would like to request for the Job Leaving Certificate also along with my EOS dues as I need to submit it to my new employer. With due respect it is to state that I had filed my resignation one month ago. According to company regulations my working days will be over soon. Therefore, it is requested that a job leaving certificate be granted to me along with an experience letter. I need both documents to apply for next job. I hope you will be considerate of my position. Sample request application letter for re issuance of experience certificate or internship experience certificate to provide the new employer. Sample application to request duplicate experience certificate from company, employer, office or factory for new job as a reference or proof of experience. I hope you are doing well. I intend to write this email to ask you for a favor and your help will be much appreciated. I, Syed Muzzammil Hasan, was a part of your social internship program at the RS Institute for special children two years ago. I was alloted the resource department and was designated the task of making proposals for fundraisers. The month long internship turned out to be a great experience for me. The problem is that I seemed to have misplaced my internship certificate. I need to provide it to my new employers at UBL. My recently acquired job requires me to provide them with proof of experience. Because of this very short notice and my state of urgency I considered contacting you to be the safest option. Therefore, I humbly request you to help me out in this situation and kindly reissue me a certificate if that’s not a problem. Thank you for taking out the minutes of your precious time to read this. Looking forward to hear from you regarding this matter. It is stated that I did my internship at your institution in 2012. My name is Oma Ahmad and father name is Naveed. It is to inform you that unfortunately,I have lost certificate of internship issued to me by your prestigious institution during shifting of the house from Lahore to Karachi, since then i can’t find my certificate again in this regard. I request you to kindly reissue me the certificate once again as this holds enough importance for completion of my bachelors degree. Requirement : Kindly mention 100 credit hours on the certificate as this is college requirement. Address : C/O Naveed, DHA , Lahore. Currently I’m living in Karachi.Thanking in anticipation. 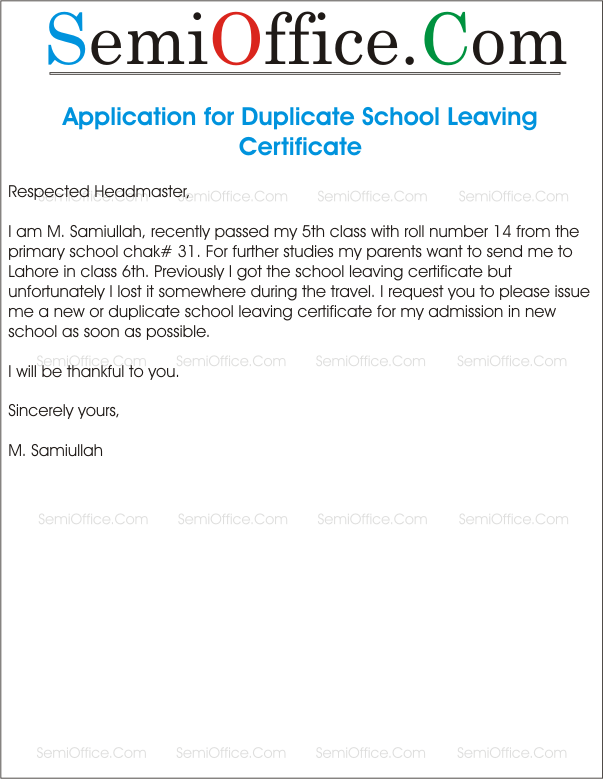 Sample application for issuance of duplicate school leaving certificate to headmaster of the school in private sector or government sector. School leaving certificate is a compulsory document to provide for admission when you change your school or college. This certificate verify that you were the student at your previous school of a particular class with your date of birth and clearance of dues with passing classes and grades. It is to inform you that I’ve lost my original school leaving certificate at the campus cafeteria yesterday. I came to look for it today but couldn’t find it. It is my humble request to you to kindly cancel the validity of my original document, if found, and kindly issue me a duplicate school leaving certificate so that I can use it for my admission process ahead. I shall be very grateful to you for this kind favor. I am M. Samiullah, recently passed my 5th class with roll number 14 from the primary school chak# 31. For further studies my parents want to send me to Lahore in class 6th. Previously I got the school leaving certificate but unfortunately I lost it somewhere during the travel. I request you to please issue me a new or duplicate school leaving certificate for my admission in new school as soon as possible.